According to JAMA more than 10 million Americans are affected with knee osteoarthritis.Most commonly affecting a population age 45 and greater this condition occurs as the cartilage in the knee wears away eventually causing bone on bone contact between joint surfaces. Most common complaints include joint swelling, joint stiffness, and pain. Knee osteoarthritis can be diagnosis via radiographs indicating boney cysts, narrowing joint space, and scelrosing of the bone. In other words osteoarthritis involves the degradation of joints, including articular cartilage and subchondral bone. But also ligaments, the capsule and the synovial membrane degenerate. This will eventually lead to pain and loss of function. Osteoarthritis is the most common disease of joints adults suffer from worldwide. The name ‘osteoarthritis’, a Greek word, can be divided in ‘osteo’, ‘arthro’ and ‘it is’. If we translate the word we become ‘of the bone’, ‘joint’ and ‘inflammation’.” Thus, simply put, we can say that osteoarthritis is an inflammation of the bone and joint. Besides knee osteoarthritis, which is the most common, you also have hand and hip osteoarthritis. The knee joint consists of both approximation of the proximal tibia and the distal end of the femur. The cartilage located on the ends of the femur and tibia contain an extra cellular matrix that contains type 2 protoglycans that function by drawing fluid into the joint causing increased shock absorption and proper joint nutrition. There is some evidence to support that as the aging process occurs the type 2 collagen fibers decrease in size and therefore less fluid an nutrition gets into the joint surfaces eventually leading to decreased protection along boney surfaces. The knee (art. genus) is a synovial joint, which consists of 3 articulations. The primary joint, art. tibiofemoral, is located between the convex femoral condyles and the concave tibial condyles. There is also the art. patellofemoralis between the femur and the patella and the art. tibiofibularis located between the tibia and fibula. OA can only occur in the two primary articulations of the knee, namely the tibiofemoral and patellofemoral joint, because they have to sustain more motion than the art. tibiofibularis. “The pathogenesis of knee OA have been linked to biomechanical and biochemical changes in the cartilage of the knee joint.” (Kirstin Uth et al, 2014) The cartilage ensures that the bone surfaces can move painless and with low friction to each other. In OA, the cartilage decreases in thickness and quality, it becomes thinner and softer, cracks may occur and it will eventually crumble off. 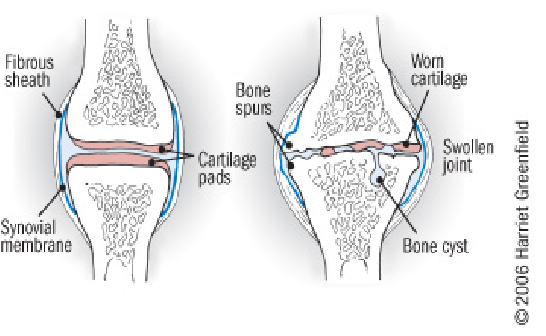 Cartilage that has been damaged, cannot recover. Finally the cartilage will disappear. The bone surfaces can also be affected, the bone will expand and spurs (osteophytes) will develop. Signs of knee osteoarthritis are pain at beginning of the movement, later on pain during movement and eventually permanent pain. These patients will also experience a loss of function like stiffness, decreased range of motion (ROM) and impairment in everyday activities. Other possible characteristics of knee OA are bony enlargement, crepitus, joint-line tenderness and elevated sensitivity to cold and/or damp. Stage 0: This is the “normal” knee health, without any pain in the joint functions. Stage 1: A person in this stage has very minor bone spur growth and is not experiencing any pain or discomfort. Stage 2: This is the stage where people will experience symptoms for the first time. They will have pain after a long day of walking and will sense a greater stiffness in the joint. It is a mild stage of the condition, but X-rays will already reveal greater bone spur growth. The cartilage will likely remain at a healthy size. Stage 3: Stage 3 is considered as a moderate osteoarthritis. People with this stage will experience a frequent pain during movement. The joint stiffness will also be more present, especially after sitting for long periods and in the morning. The cartilage between the bones shows obvious damage, and the space between the bones is getting smaller. Stage 4: This is the most severe stage of osteoarthritis. The joint space between the bones will be dramatically reduced, the cartilage will almost be completely gone and the synovial fluid will be decreased. That is why people will experience lots of pain and discomfort during walking or moving the joint. The diagnosis can be established by clinical examination, and it can be confirmed by X-rays. The main characteristics are changes in the subchondral bone, joint space narrowing, subchondral sclerosis, subchondral cyst formation and osteophytes. In early stage of osteoarthritis, the results of the radiography can show a minimal unequal joint space narrowing. If it deteriorates you still find the same problems, but the patient experiences a lateral subluxation of the tibia as well. If it deteriorates more, the joint line will disappear completely. It is shown in the picture that the medial joint space is more narrow than the lateral joint line. Some differential diagnosis can be: bursitis, iliotibial band syndrome, ligamentous instability (medial and lateral collateral ligaments) and meniscal pathology, these are conditions in whereby the soft tissues of the knee are affected. But also other forms of arthritis can lead to differential diagnosis of the knee, think of gout and pseudogout, rheumatoid arthritis and septic arthritis. X-ray: The basic X-ray is used to research breakdown of cartilage, narrowing of joint space, forming of bone spurs and to exclude other causes of pain in the affected joint. Arthrocentesis: This is a procedure which can be performed at the doctor’s office. A sterile needle is used to take samples of joint fluid which can then be examined for cartilage fragments, infection or gout. Arthroscopy: is a surgical technique where a camera is inserted in the affected joint to obtain visual information about the damage caused to the joint by the osteoarthritis. The European League Against Rheumatism developed diagnostic criteria for diagnosing knee osteoarthritis. The most important factors are shown in the following figure. If a patient is referred to you by a doctor, it is most likely he performed a medical examination. It is imperative to look at his/her findings when examinating the patient. Inspection: Mind the position of the joints when in rest and how the patient moves. This can be accomplished by making the patient perform simulations of daily activities such as getting up from and down on a chair, stair climbing, etc. Palpation: Mind: swelling, temperature differences, muscle tonus. Also be wary of possible bone spurs (osteocytes) that have formed on the edge of the joint. These osteocytes are a serious indication towards osteoarthritis. Examination of basic functions: Testing of muscle power, coordination, mobility, balance and also stability of the joint. These factors can be tested by active test like standing on one leg and passive manual tests. When testing stability of the joint muscle strength and proprioception are of significant importance. 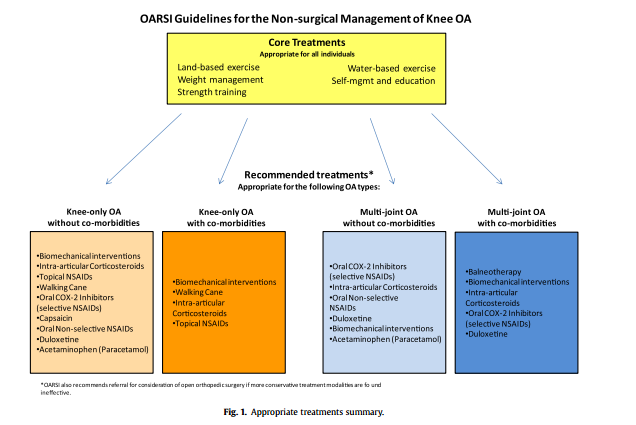 The main goal of any therapy for patients with knee OA in most cases is to reduce pain and improve the physical functioning. The summary as mentioned above is consisted of numerous treatments for osteoarthritis, divided into medical and physical therapy management. A pain and fever relieving OTC* drug. Because of its safety and mild effectiveness, it is one of the most used oral medicine. It is also proven to be effective when acetaminophen can be combined with other drugs, e.g. ibuprofen, both with lower doses. If there isn’t any significant or positive response to the use of acetaminophen, NSAID is then recommended. NSAIDs are primarily used for joint pain. Despite its common use, the consumption of this drug should be limited to short-tem, in order to control episodic painful flaresand to prevent other side effects, such as myocardial infarction and stroke. Both forms are advised to contain cyclooxygenase 1 and 2 (COX-1 and COX-2) inhibitors, which help in gastric mucosa protection. Pain relieving fluids that are consumed if opioids aren’t sufficient. They are directly injected into the arthritic joint of the knee in full extension. Hyaluronic acid and corticosteroids are examples of injected fluids. Patients have to be prudent when taking medicines. All drugs have side effects, some more than other, thus it is very important that patients with other health issues verify if they may use a particular medication. Cardiovascular gastrointestinal are the most common side effects. Glucosamine is a much used drug. Because of their lack of benefit, they are not recommended; ditto for chondroitin sulfate. Topical capsaicin creams contain extracts of chili pepper that activate a burning sensation. Although many studies do not recommend those creams, other report that it is effective. Knee osteoarthritis mostly affects the weight-bearing joints and leads, amongst other things, to pain and muscle weakness. The strength of muscles around the affected joints can be built up by graduated exercises making use of buoyancy and floats (in the later stage of the treatment). (Level of Evidence AB) , (Level of Evidence 1B). It has been shown that water buoyancy can reduce the weight that joints, bones and muscles have to carry. (Level of Evidence 1B) Range of motion can also be maintained and increased (Level of Evidence 1B)using the freedom of movement offered by the water with the support given by the buoyancy. Functional difficulties of osteoarthritis patients are generally walking and climbing stairs and much can be done to re-educate such patients in the pool. (Level of Evidence 1B). Many patients are more mobile in water than on land and this gives them greater confidence and a sense of achievement. Despite the controversy, other studies show that aquatic exercises (Aquatherapy) have some short-term beneficial effects. (Level of Evidence 1B).Thus, the results indicate that hydrotherapy is applicable and efficient for patients with knee OA. Though there are short-term effects, long-term effects have yet to be investigated. (Level of Evidence 1B) Aquatic exercise may therefore be considered as the first part of an exercise therapy program to get particularly disabled patients introduced to training. (Level of Evidence 1B). “Rest” braces: are not advised due to weakening of the quadriceps muscle. Knee sleeves: maintain warmth and (mild) compression. Corrective braces: used by patients with moderate or severe knee OA. They provide and reduce compression of the joint and improve proprioception and strengthening of the quadriceps. Has proven to be slightly effective in decreasing pain and disability for patients with knee OA. (Level of Evidence 1B) These beneficial effects are short-termed. Arthroscopic surgery: Damaged cartilage will be removed. It only has short-term effects. Knee replacement surgery: It is proven to reduce pain and increase the mobility. This type of surgery has long-term beneficial effects. ↑ S.R Goldring, M.B. Goldring. 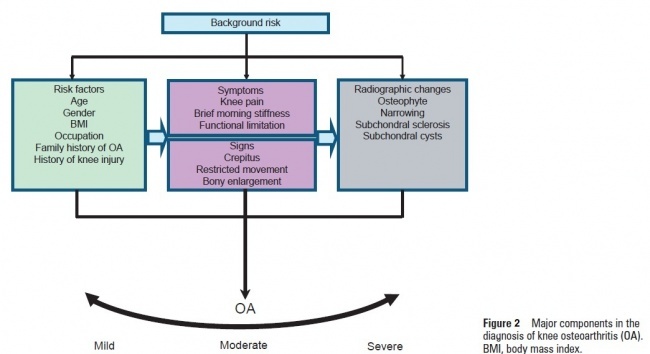 Clinical aspects, pathology and pathophysiology of osteoarthritis. J Musculoskelet Neuronal Interact 2006; 6(4):376-378.